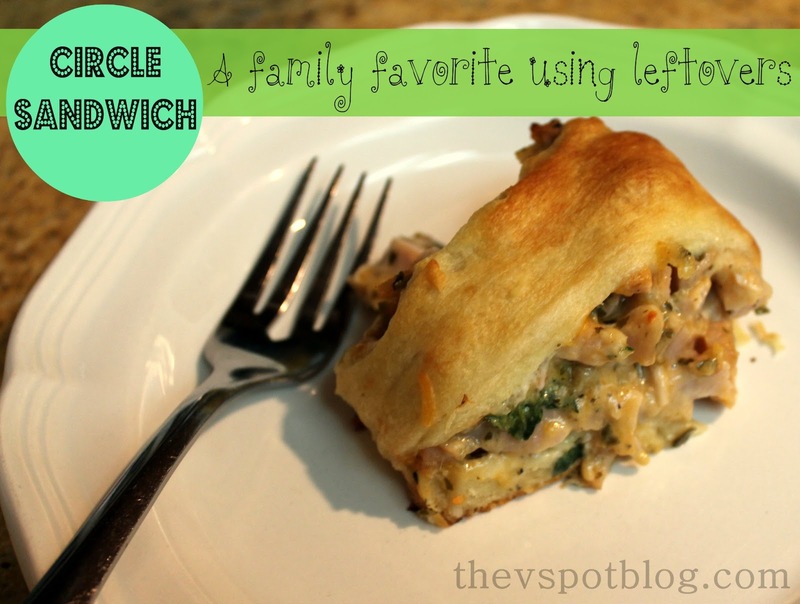 Today I am going to share a super fast, super easy way to use up leftovers in your fridge and make a dinner that your family will fight for the last piece of… (Or at the very least have a few rounds of Rock-Paper-Scissors over.) We call it The Circle Sandwich. I know I am not the only one who has leftovers and family members who don’t want the same thing two nights in a row. This takes care of both issues! Are these photos going to be beautiful? No. But that’s because I was throwing dinner together and not thinking about a blog post. Take about 3 cups of whatever cooked meat you have on hand… ham, chicken, pork, whatever. I had smoked turkey, so that’s what I used. Once you dice up the meat you’ll be using (chicken and bacon is a delish combo!) add in a healthy dollop of mayonnaise some dijon mustard and some prepared basil pesto. Just mix it up until you get a consistency and a flavor you like. I am not going to give you amounts and measurements, because I don’t use them. Just eyeball this. Once it’s mixed, add in a handful of shredded cheese and salt and pepper. I also had some grape tomatoes and a little bit of fresh spinach that needed to be used up. I added them in too. Once you have your starburst shape, spoon the filling onto the circle and tuckthe points of the dough up and over the filling so that you form a ring.. Bake at 375 until it’s hot and bubbly and the dough is golden brown. I know this concept isn’t anything new, but the fact that you can pretty much use anything in the fridge to make it is a very, very good thing. So dang easy! What’s in your refrigerator that could go into this…? I have never used that dough before. Does it explode when you try to open it? I’ve seen on TV where it just oozes out of the split can. Great tip! I ALWAYS have leftover meat and such in my refrigerator. I think my family is tired of my use em up methods. Trying something new! Just beautiful! 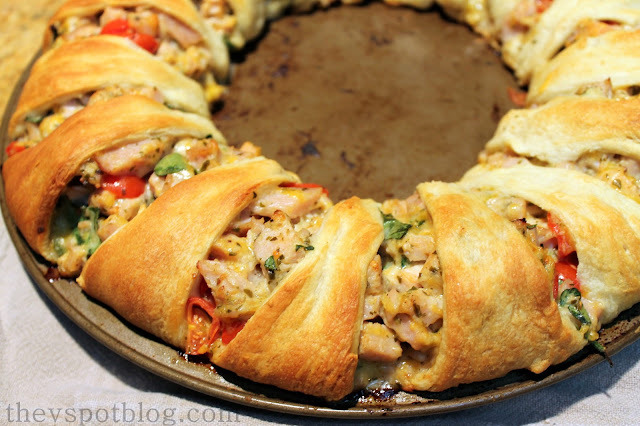 It goes along with my “Fun with crescent rolls” series– I’ll need to try this and link back here!